The social implications of a wide variety of technologies are the subject matter of the IEEE Society on Social Implications of Technology (SSIT). 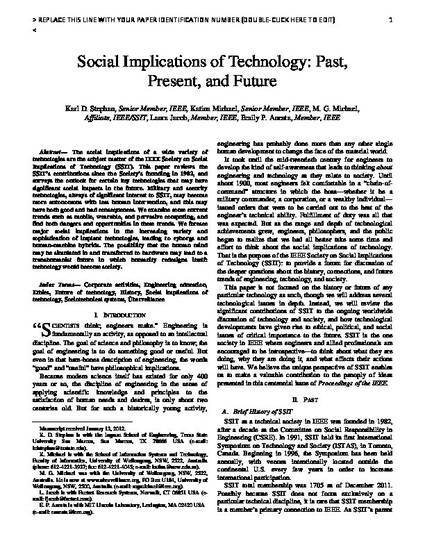 This paper reviews the SSIT’s contributions since the Society’s founding in 1982, and surveys the outlook for certain key technologies that may have significant social impacts in the future. Military and security technologies, always of significant interest to SSIT, may become more autonomous with less human intervention, and this may have both good and bad consequences. We examine some current trends such as mobile, wearable, and pervasive computing, and find both dangers and opportunities in these trends. We foresee major social implications in the increasing variety and sophistication of implant technologies, leading to cyborgs and human-machine hybrids. The possibility that the human mind may be simulated in and transferred to hardware may lead to a transhumanist future in which humanity redesigns itself: technology would become society.